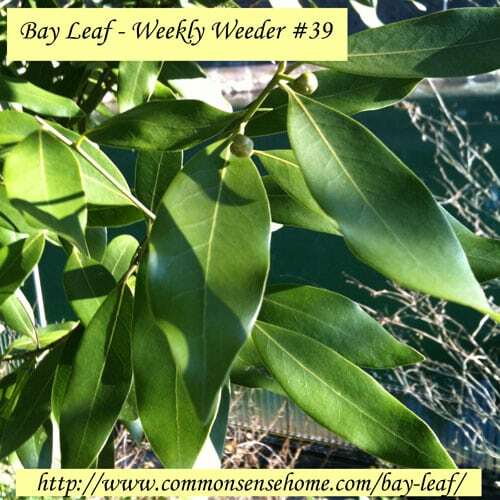 Today’s Featured Plant is Bay leaf, or Bay Laurel. Bay leaf is one of those herbs that is unnecessarily expensive in the store and, in warm-to-moderate climes, so easy to pick for free! 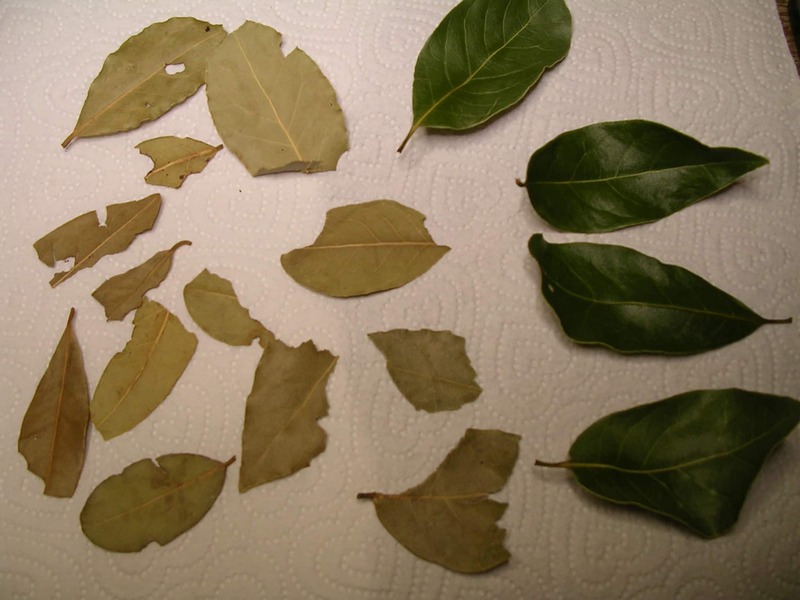 There are a number of different kinds of bay leaf that are edible to humans. 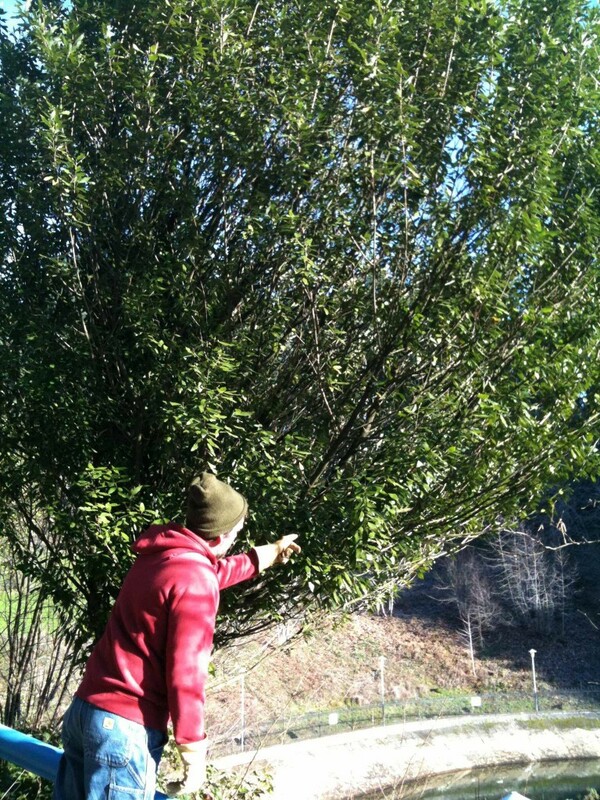 The one most Americans know is Laurus nobilis, which comes from the Mediterranean. Another is Umbellularia californica, which originated on the West Coast and is well established in California and Oregon, and will probably grow in most Southern states as well. There are also species in India, Mexico, Indonesia and the Caribbean. This is an evergreen, upright tree, not a shrub, though you can grow it as a bonsai, which will keep its size moderate. Known variously through its range as Bay, California Bay, Bay Laurel, Pepperwood, Myrtle and Myrtlewood, it is easily identified by its thick, leathery and strongly scented lance shaped leaves. Almost everyone is familiar with the dried bay leaf of commerce. These are from the venerated “Old World” tree Laurus Nobilis. If you imagine these leaves just a little longer and narrower (more lanceolate is the botanical term), as well as green and fresh and without the wavy margin, you pretty much have the California Bay leaf. Just because bay leaf is “edible” does not mean you munch on the leaves, however. They are very stiff, even after hours of cooking, and can cause serious damage (i.e. lacerations) to your digestive tract. Instead, the leaves’ flavor is imparted to meat, a sauce, or soup by way of cooking them in or alongside what you’re making. In the case of liquid food, simply drop one or two in whole, and pull them out before serving. Or, grind them into a fine powder. You can even add bay leaves to ice cream! The large, mature leaves hold more oils (and therefore more flavor) than the young leaves. Pick whole, healthy leaves that are free of insect or fungal damage. 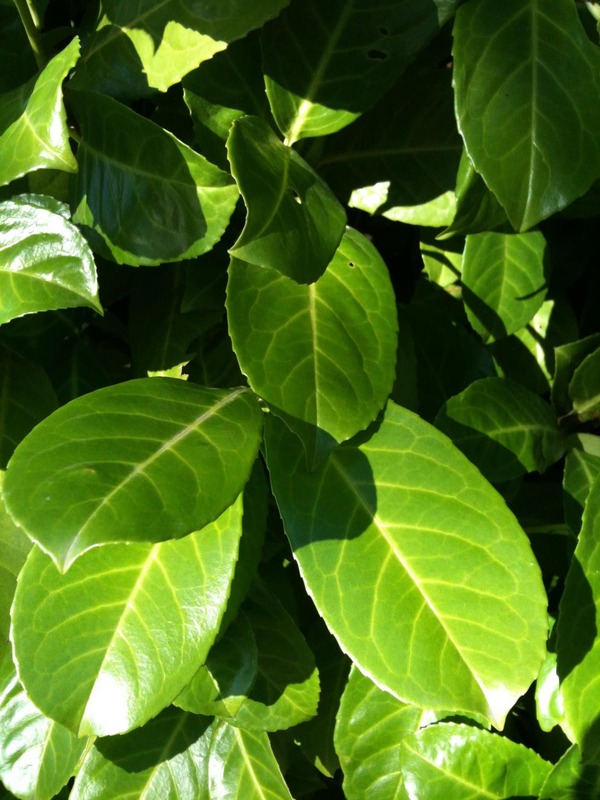 Another thing to watch out for: Decorative laurels like English laurel (Prunus laurocerasus) or cherry laurel (Prunus caroliniana) are actually poisonous, so be very sure you’ve got what you think you have before you start whipping out the marinara. 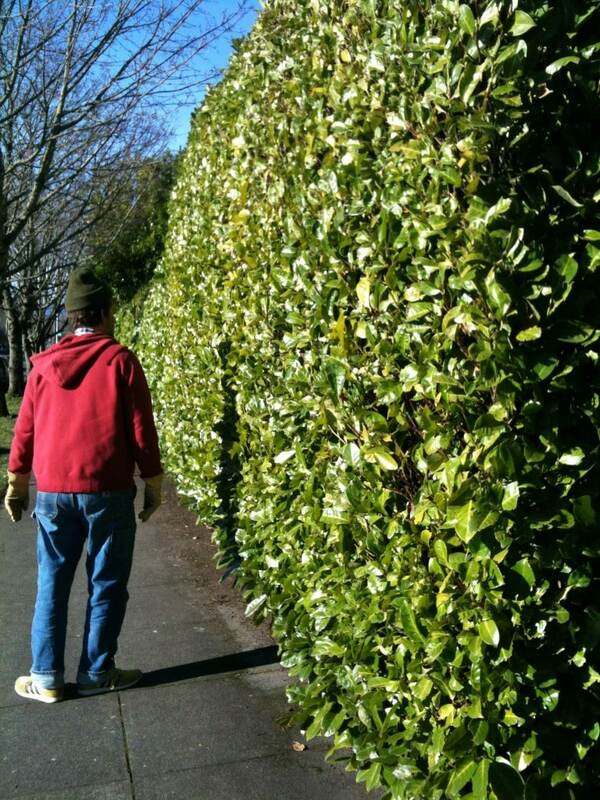 This English laurel hedge extends 10 feet in one direction and 50 in the other! My friend Ivy (no relation—ha ha; gardening humor) recently came over our house with a handful of bay leaves she’d picked on a walk. After washing and toweling them off, I simply laid them on a paper towel for a few days while they dried out, and put them in a glass jar. If you do the same, be sure the leaves are completely dry before you store them, or you might end up with moldy leaves. Check the jar after a day or two; if there is any moisture inside the jar take them out and continue to dry them. You can also cut a small branch and hang it upside down out of direct sunlight—the leaves will dry on the branch. Before I stored the leaves Ivy brought over, I compared them to the Mexican bay leaves I’d previously bought at the grocery. The latter weren’t very expensive, but then again—look at them! Which would you rather eat? Editor's note: I purchased bulk organic bay leaves from Frontier, because the tree doesn't grow around here, and my leaves are whole and green. If you live in a part of the United States that has real winter (and therefore doesn’t have laurel), consider an indoor plant—it’s fairly easy to propagate. It has some rather specific requirements, but can be worth the trouble. Buy your own bay leaf plant. Mountain Rose Herbs stocks many of the herbs and plants featured in the Weekly Weeder and our herbal remedies. They also carry an assortment of bottles, droppers and other supplies, plus some really soft organic cotton t-shirts. Hi–can you tell me what kind of bay leaf is in your first photo above with the nodules (pods) on it? The photos were from Kristy. I believe it’s Umbellularia californica. I live in Seattle; I have successfully overwintered a potted sweet bay in a container. Now its June and the leaves on the plant (still inside the house) are curling up. How should I groom the plant, should I pull all leaves off to encourage new growth or trim the branches. I don’t see any new growth and that is my concern. Thanks, your website has been so helpful! !